Whether for work or school, the Ectaco Android Dictionaries and Bluetooth CPen combo pack will help you translate instantly through any one of these 19 languages: English, Spanish, French, German, Italian, Portuguese, Polish, Russian, Czech, Romanian, Greek, Bulgarian, Hungarian, Croatian, Serbian, Slovak, Albanian, Bosnian, Armenian, Ukrainian. Compatible with any Android device, just link the Bluetooth CPen, scan, and find the text on your screen with the ability to translate and even pronounce fluently. Whether for work or school, the Ectaco Android Dictionaries and Bluetooth CPen combo pack will help you translate instantly through any one of these 19 languages: Arabic, Chinese, French, German, Hebrew, Indonesian, Italian, Japanese (kana), Korean, Persian, Polish, Portuguese, Russian, Spanish, Tagalog (Filipino), Thai, Turkish, Vietnamese. Compatible with any Android device, just link the Bluetooth CPen, scan, and find the text on your screen with the ability to translate and even pronounce fluently. Whether for work or school, the Ectaco Android Dictionaries and Bluetooth CPen combo pack will help you translate instantly through any one of these 12 languages: Arabic, Chinese, Farsi, French, German, Italian, Japanese, Korean, Polish, Portuguese, Russian, Spanish. Compatible with any Android device, just link the Bluetooth CPen, scan, and find the text on your screen with the ability to translate and even pronounce fluently. Whether for work or school, the Ectaco Android Dictionaries and Bluetooth CPen combo pack will help you translate instantly through any one of these 8 languages: Chinese, French, German, Italian, Portuguese,Polish, Russian, Spanish. Compatible with any Android device, just link the Bluetooth CPen, scan, and find the text on your screen with the ability to translate and even pronounce fluently. 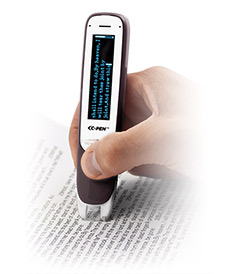 The Dictionary Pen is a portable digital tool powering linguistic understanding and work/study efficiency. Technically it is a Digital Highlighter pen with high quality Optical Character Recognition (OCR), naturally speaking TTS, and multiple dictionaries supporting Chinese, English, French, German, Italian, Russian and Spanish. 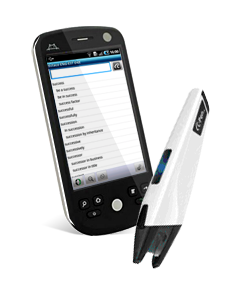 Whether for work or school, the Ectaco Android Dictionaries and Bluetooth CPen combo pack will help you translate instantly through any one of these 5 languages: Spanish, French, German, Italian, Portuguese. Compatible with any Android device, just link the Bluetooth CPen, scan, and find the text on your screen with the ability to translate and even pronounce fluently. Whether for work or school, the Ectaco Android Dictionaries and Bluetooth CPen combo pack will help you translate instantly through any one of these 5 languages: Russian, Bulgarian, Hungarian, Ukrainian, Polish. Compatible with any Android device, just link the Bluetooth CPen, scan, and find the text on your screen with the ability to translate and even pronounce fluently.